Providing a blissful base in central Lugano, this modern 1 bed retreat offers a convenient and carefree getaway in all seasons. Perfectly suited for couples or groups of 4, the 3rd floor apartment can easily be reached by lift. Once inside, guests will be greeted by a bright and inviting living area. Open plan for relaxed holiday living, guests can unwind to the comfortable sofa, cook up a simple meal in the contemporary kitchenette and savour quality moments to the round dining area for 4. A SAT TV with DVD player and WIFI access also feature to the apartment for guest’s convenience. The kitchen is equipped with all the must-have appliances for stress free holiday meals in, with an oven, toaster, microwave and coffee machine to hand. The inviting indoor dining area is further complemented by a bistro dining set to the private covered balcony. With views across the vibrant cityscape towards the beautiful mountain tops beyond, the backdrop is enticing in any season. Guests can easily unwind out here and while away the hours with a cup of coffee or a relaxed meal. The spacious apartment further benefits from flexible sleeping arrangements, comprising a contemporary double bedroom area with chic fitted wardrobe and mountain views, alongside a comfortable double sofa bed to the adjoining open plan living area. A bathroom fitted with bath tub and overhead shower completes the internal accommodation and laundry facilities are also to hand. From the modern and welcoming 6 storey residence, public parking is within easy reach. Situated in a convenient town location, guests have all the delights and amenities of lovely Lugano on the doorstep. Lugano Train Station is located just a 4 minute walk away and a frequent bus service operates along Via San Gottardo, for extra convenience. Those looking to explore the Swiss Italian Lake region whilst on holiday will find a Hertz car rental centre here on the doorstep too. The heavenly lakefront of Lugano is within easy walking distance, just 10-15 minute’s walk away. Guests can enjoy a picturesque morning coffee in one of the sunny piazzas, take a lakeside stroll in the beautiful Parco Civico with an ice cream or soak up a spot of shopping, along the designer boulevards and the bustling central shop-lined quarters. Guests will find a wide selection of modern supermarkets in Lugano, alongside weekly food markets and authentic restaurants perfectly catering for either relaxed meals out and for more refined dinner occasions. The communal Lido in Lugano provides the perfect excuse to soak up some sun and enjoy a classic day out in the summertime, whilst the nearby beauty spots of Monte Bre, Monte San Salvatore and the Olive Trail all offer a lovely excuse to take in a picture-perfect walk and picnic. The fashionable Swiss lake capital also boasts a treasure trove of cultural delights to visit, with the Museum of Cultures, the Museo Cantonale d’Arte and a host of ancient fresco-lined cathedrals and churches to explore. Lugano also offers boat rental, boat trips, ferry crossings, tennis and water sports alongside a vibrant nightlife that includes bowling alleys, trendy bars, buzzing night clubs and contemporary Casinos. 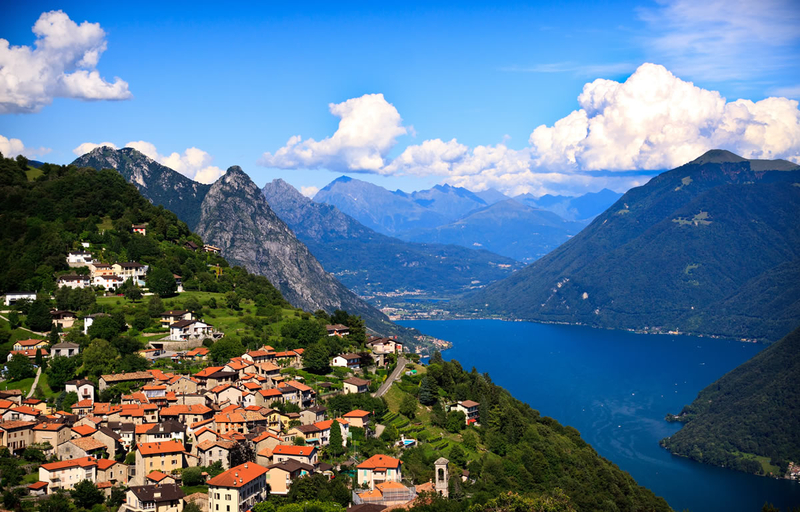 Lugano is ideally located for reaching Lake Como, just 40 minutes drive away. Here classic villa attractions, botanical gardens, dramatic scenery and a spot of La Dolce Vita a waits!